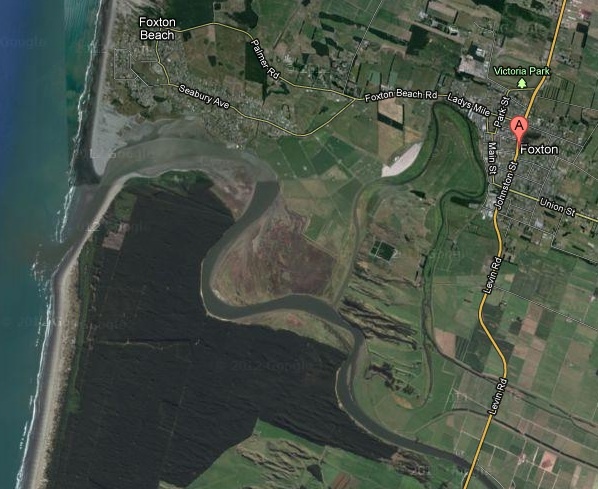 The history and identity of the Horowhenua coastal town of Foxton is intrinsically linked to the Manawatu River. It was once a bustling port town, with ships loaded with flax, timber and other goods travelling down the river and out to markets in Wellington and beyond. While coastal shipping had largely ceased by the early 20th century, the wharf and the river that it served, was an integral part of the town’s identity and economy. However, today, the lower loop of the once bustling Manawatu River is a polluted, weed-infested lagoon, which locals are urged not to come into contact with, let alone swim in. The story of how Foxton lost Piriharakeke (literally, [the river] that flax clings to) is directly linked to the environmental history of the Manawatu region as a whole. Until the early part of the 20th century, the flax industry was central to the prosperity of the town. However, with the decline of the industry, the district turned from flax cultivation to farming. Landowners started draining the wetlands that had provided flax, and as more and more farms were developed, the capacity of the lower Manawatu plains to absorb excess flood waters was severely reduced. Floods became more frequent and damaging, and the catchment board scrambled to find solutions to the flooding “menace”. Finally, in the 1930s it was decided to create a spillway at Whirokino. However, in 1943, an unexpected flood swept through the spillway cut, creating a direct channel between the upper and lower part of the loop, and cutting off the Foxton loop. Severely reduced flow through the loop meant that the harbour was no longer able to function and eventually, with the accumulation of silt and sediment, the upper part of the loop became completely cut off form the main part of the river. With only tidal flow entering this part of the river, pollutants accumulate without any means of being flushed out. Older locals who remember swimming, boating and fishing in the river as children now express sadness and anger that their children and grandchildren have been unable to enjoy the river as they had. The loss of this important connection with the river has caused anger and resentment in the Foxton community and over the decades there have been many attempts to have the Foxton loop restored – if not as the primary course of the river, at least so that it once again flows and can be enjoyed as a waterway. There have been deputations to Parliament, countless meetings with council officials, and a number of council reports (the most recent of which was released by the Horizons Regional Council earlier this year). The local community has also worked to restore flow and the river’s amenity by digging out weed and silt, planting native trees along the river and creating wetlands and walkways. Locals have noticed that even these piecemeal efforts have seen the return of fish and kingfishers, at least for a time. However, many acknowledge that there is a limit to how much it can achieve without opening the loop up again to allow improved flow. While recognising that Foxton will never again be a bustling port, people in the community express a desire for their grandchildren to enjoy a flourishing waterway that can once again be Piriharakeke (the river to which harakeke flax clings) in reality as well as name. Photo top: Foxton on the Manawatu River, 1879, watercolour by Robert George Palmer. Shows a paddle-steamer, three larger ships and a canoe on the Manawatu River, houses and A. J. Whyte’s hotel (the large building on the left) viewed from the opposite bank of the river. Not to be reproduced without permission by Alexander Turnbull Library, Wellington, ref. ID: C-030-014 Middle: A satellite view of the area today, the cut off original course of the river can be faintly seen looping up to the town of Foxton. Above: Entitled “Protecting a main highway from flood menace: work on the Whirokino Deviation at Foxton”, this photograph appeared in the Auckland Weekly News in 1936. Sir George Grey Special Collections, Auckland Libraries, AWNS-19360617-45-1. Next Article When is a fence not a fence? Hard not to despair at the blind stupidity of our addiction to “growth” and “progress.” Dissemination of documentation like this can only help to prevent more of the same. I hope. Its a long time since you wrote the above – but 6 years on its still true isn’t it. It’s called breeding. My generation was the last to swim from the shores of Foxton (township) over to Matakarapa in the early 1960’s! Harbour Street was our “natural play-ground” for swimming/fishing and working in teams on the mudflats of Matakarapa (putting our arms down the “eel-holes” to flush out the “Tuna”) were great memories …..